AVID Property Group’s recently launched development, ‘Harmony’, has shown it’s true colour – green. The development was recognised as one of South East Queensland’s most environmentally conscious masterplanned communities, having received the region’s first ever six ‘Leaf’ national EnviroDevelopment certification in masterplanned communities from the Urban Development Institute of Australia (UDIA). Harmony’s maximum score accreditation comes as a result of providing design and planning excellence across multiple elements like ecosystems, waste, energy, materials, water and community. AVID Property Group General Manager Bruce Harper said it had been a huge couple of months for the project, officially launching in August and now achieving a south-east Queensland and Sunshine Coast first in sustainable and environmental design. 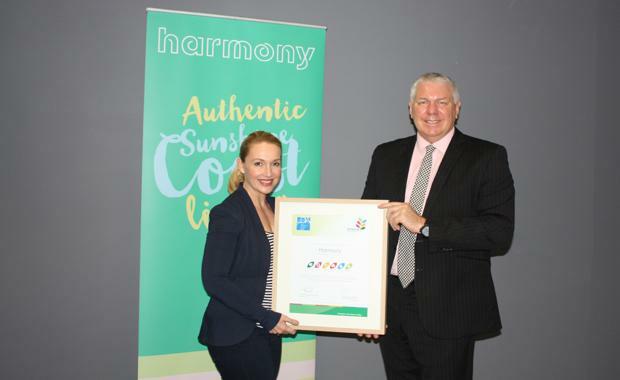 “We are very proud Harmony has achieved industry recognition,” he said. Around 70 per cent of lots have been built to maximise solar amenity for residents, and a new stormwater management system was implemented throughout the development to minimise environmental impact and enhance the aesthetics of the community. Mr Harper said 100 hectares of Harmony’s total 378 will be allocated to open space for residents to enjoy. The UDIA’s EnviroDevelopment certification is a scientifically-based assessment scheme which independently reviews development projects to award certification across four or more elements - ecosystems, waste, energy, materials, water and community.